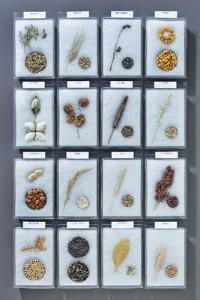 Specimens and statistics on the most common U.S. agricultural produce. Shaft heads and grains of each crop variety are featured on these mounts. On the back of each mount, the annual statistics for acreage harvested, yield, total production, and value in the U.S., as well as a map showing the states it is grown in is displayed. The set of 16 individual displays includes alfalfa, barley, buckwheat, corn, cotton, hops, millet, oats, peanuts, rice, rye, sorghum, soybean, sunflower, tobacco, and wheat.